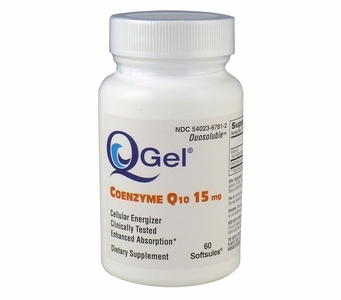 15mg of Hydrosoluble™ Coenzyme Q-10 (ubidecarenone). Hydrosoluble™ Q-Gel® provides several times higher CoQ10 plasma levels than conventional dosage forms and achieves therapeutic levels of CoQ10 in a matter weeks. It has undergone clinical scrutiny in humans. For complete ingredient listing and label copy please see Supplement Facts tab. Free of: Milk or milk by-products, egg or egg by-products, fish, shellfish, tree nuts, peanuts/oil, wheat, starch and yeast. Directions: Take one (1) softgel daily as a dietary supplement or as directed by your healthcare professional. Softgel to be taken with or after a meal. Keep bottle tightly closed. Store in a cool, dry place at controlled room temperature 15°-30°C (59°-86°F). Q-Gel®, Softsules®, and CoQ10Pure®(logo) are registered trademarks of Tishcon Corp.
Duosoluble™, Hydrosoluble™ and Liposoluble™ are trademarks of Tishcon Corp. Manufactured under one or more of the following U.S. Patents: 6,056,971 and 6,300,377. Manufactured by: Gel-Tec, Division of Tishcon Corp.